The NHS says just one in 10 drinks sold in English hospitals will be sugar-sweetened, as part of its bid to curb rising obesity levels. NHS England believes that cutting sugary drink sales in hospitals could help patients, staff and visitors cut down their sugar intake, tackle obesity and ward off related illnesses such as diabetes. Over half of NHS workers are believed to be overweight or obese, which NHS England says not only affects staff sickness, but also their ability to give patients credible health advice. 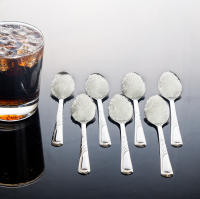 The national health body announced that all 227 trusts across England have pledged to reduce sales of sugar-sweetened drinks to 10% or less of their total drinks sales. Trusts already signed up to the pledge have seen significant reductions in sales of sugar-sweetened drinks, with the proportion of drinks sold on NHS premises that contain added sugar reduced to just 7.4% in participating trusts. This means that nearly 30 million teaspoons of sugar have been removed from NHS canteens, shops and vending machines. "Every hospital in the country is now answering this important call to action and the NHS is rightly leading the way in battling the growing obesity epidemic across the country," said NHS England chief executive Simon Stevens. "Obesity and its associated dangers is a worrying challenge facing the NHS and so it is crucial, as we draw up a long-term plan for the future of the NHS, that we take action where we can to avoid a long list of preventable problems in the years ahead." NHS England said 23 NHS Trusts and two retailers have decided to stop selling sugary drinks altogether. Trusts have already been incentivised to limit confectionery sold in hospitals. Professor Jonathan Valabhji, national clinical director for diabetes and obesity at NHS England, added: "We have been clear that the growing obesity rates sweeping the country are a public health crisis. "Obesity is associated with type 2 diabetes, heart attacks, many of the common forms of cancer, and a string of other illnesses. "Our own sugar restrictions are delivering good results and as part of the long term plan we are exploring all potential options, including very low-calorie diets to tackle obesity and type 2 diabetes."